Engine performance and electrical diagnostics can be some of the more challenging problems we face as technicians, mechanics or weekend warriors. Solving those problems is also one of the more rewarding aspects of this line of work, whether it's your hobby or your bread and butter. The satisfaction that comes along with solving the puzzle that others could not is what keeps me coming back, as I am sure it does for many of you. So you've got the diagnostic mind set, that's why we're all here after all. But what's in your diagnostic tool set? Do you need that $100 test light that the tool truck vendor swears will fix the car for you and grab you a celebratory beer out of fridge after a job well done? Should you go ahead and order that $500 fuel pressure & flow gauge test kit you saw your favorite YouTube Certified Technician use that one time? Well, we've compiled a list of tools that we feel are essential to a basic diagnostic tool box! This isn't anything set in stone. Just like everything else, there are going to be variables. I've linked in some examples from the TOOLS section at the top of the page, but this is in no way a sales pitch! Feel free to expand or exclude as you see fit, and please, contribute to the list! OBD scan tools and code readers are not going to be on this list. Do you need one? Yes! But the features and functions vary so much depending on your budget and involvement in auto repair, that it will be best handled in another thread. The first thing not to be overlooked is hand tools! You're not going to get very far in your diagnosis if you can't gain access to the system or components you intend to test. I'm going to touch briefly on what I feel I use most during diagnosis, not necessarily repair work. That's why I'm going to exclude some things like 1/2" drive tools and wrenches. -Screwdrivers. Phillips and Flathead. The more the better, of all sizes! - 1/4" drive socket set. Metric is king! Beware of discount sets that skip sizes, they always seem to skip the one you need the most. Of course a ratchet and a few different length extensions will round off this set. -3/8" drive socket set. Much the same as the 1/4" set, metric is key. From 8mm up to 19mm should cover most everything too large for 1/4" drive tools. Make sure the set has ALL the sizes in order. I've seen them exclude 14mm, 16mm, 17mm... Don't get stuck without the sizes you need! And naturally, a ratchet and some extensions will round out this kit. And while we're talking sockets, at some point you're going to need some some spark plug sockets! 5/8ths and 9/16ths are two most common plug sizes I see, and can get you through most jobs before you need to invest in a dedicated spark plug socket set. -Torx and Allen. I prefer torx and allen sockets over drivers, but they each have their place and use. To each their own! -Pliers. There's a lot of different pliers out there! But have a set of pliers that will open and close enough to pull off pinch style hose clamps. Some vise grip (needle nose type and blunt jawed ones) and channel lock style pliers are always useful, as well as a set of side cutters. Sometimes it's easier and more cost effective to buy a set containing multiple different pliers styles. Of course, one can never have enough hand tools, so feel free to expand on this list to fit your needs! So, you've got your tool set together, great! Now no air cleaner intake tube or wire harness hold down will stop you from testing that relay control circuit! On to the testing equipment then! First thing's first, #1 in the kit, tried and true! -Test light. An incandescent type bulb with a tungsten filament like the one HERE . This will go a long way to verifying the presence and integrity of power and ground. As Scanner Danner has shown us, it can be used to check for spark, to apply power in low current circuits, and activate ground side switched components. This can also be used in the place of a noid light, which did NOT make this list. -Multimeter. This is another expansive topic, but there are a few key features to look for in a multimeter. You're going to want one with a fused amp meter. Duty cycle will be a valuable feature in certain scenarios. David Hobbs of Motor Age Magazine penned a recent article regarding the choice of a quality automotive multimeter. I'll link in the article HERE . Andy turned Tyler and Myself onto this Owon bluetooth capable meter . It's been great for me, but is not by any means the only one out there. -Back probes or T-pins. You can make them, you can buy them (HERE for example) but you need to have them! They're your window into the functioning circuit, and without them, you'll be forced to break to the circuit to make your checks. -Spark tester. THIS is the one that I use. An adjustable spark tester like this will give you a much better idea of the quality of spark as opposed to some of the bulb type inline spark testers on the market. As mentioned before, a testlight can be used for a down and dirty test if you don't have one of these yet. You don't have to run right out and blow a week's pay on a professional quality gauge and adapter set, but at least have a low cost unit like THIS one available from Home Depot. With a little ingenuity, you'll be able to T into at least a handful of the cars you'll encounter. -Vacuum gauge. I don't think that there's an easier to use or more cost effective tool you can have to verify the mechanical health of an engine than a VACUUM GAUGE . I can think of many instances where money and time was wasted on ignition components and computer controlled devices when a quick check on the intake manifold would have revealed valvetrain related damage early on in the diagnosis. It can be used to identify a multitude of issues in the right hands. I mainly use mine early on in misfire diagnosis, and to help ID restricted exhaust. -Compression gauge. Again, the top end Snap-On kit is probably unrealistic to the average DIY'er or somebody just becoming initiated into the art, but there are plenty of much more attainable units even at your local parts store. Again, if you can't verify the integrity of the engine, you could end up sinking a good deal of time and money into a problem that can't be fixed with solenoids or sensors! Jumper wires. With alligator clamps on the ends. Again, homemade will do the job, but you can always go out and buy some. Brake Cleaner Or carb cleaner, or a propane torch (handy any way!) to artificially enrich the air fuel mixture, or try to determine if a no start is being caused by a no fuel situation. Last edit: 14 May 2017 19:56 by Noah. That BT meter is slick. I'll have to get one of those. I have one thing to add. Information. A subscription to ShopKey, All Data, a ScanneDanner premium channel , or some other way to read up on the problem at hand. Get familiar with the theory and operation of the system you are dealing with. TSB's can save you A LOT of time. Arm yourself with knowledge BEFORE you go into battle. Nice list. Those socket sets are really handy. A jumper pack or at least a set of jumper cables in your own car will save you tremendous aggravation! Sure, they'll call you right up and let you know that the car won't start, but they won't tell you they left the key on all night because "it doesn't run anyway, who cares?" Hard to diag any complaint with a dead battery. Be prepared for that curve ball. 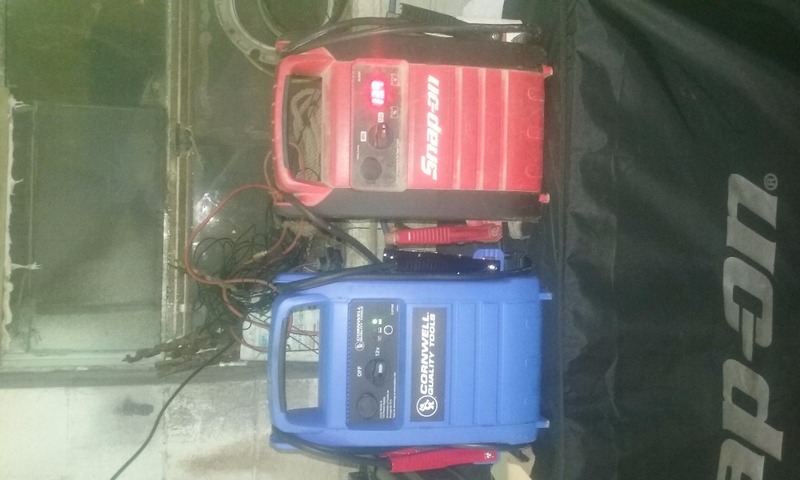 I currently use a Cornwell jump pack, which is just rebadged Midtronics unit (and is nearly identical to the Snap-On jumper for a fraction of the cost). Last edit: 25 Sep 2017 06:38 by Noah. Nice list. Keeping with the theme of Basic Diagnostic Tool Set (because we all know this list could be endless), I will add that I never leave home without my Engine Performance Diagnostics book. It's helped me a lot. 50 years ago a basic set could fit into your pockets. These days a basic set will take up the majority of a toolbox. Want to see intermittent drop outs in a sensor? A graphing meter with a high sample rate or a lab scope is essential. You can get by with very little and I've done more with nothing than some have with tens of thousands of dollars in tools. Once, I diagnosed a bad ignition coil on an ATV in the woods by taking the gear indicator bulb and wiring off it and using it as a test light. But, if you really want to be accurate and fast you need to be willing to spend money where it counts. Diagnostic tools aren't toys, they are investments that make us money. If you're a hobbyist or just want to fix your own cars you probably don't need to spend two grand on a Picoscope. It would be cheaper to load up the parts cannon. But if you do this for a living you're going to have to spend some cash. 50 years ago basic tools cost a lot more than they do now, the price of a basic 17 piece socket set was probably more in the 1960's than 50 piece is now. Last edit: 15 Jan 2018 14:30 by Andy.MacFadyen. Not sure of the etiquette here. Can I comment on an old thread? 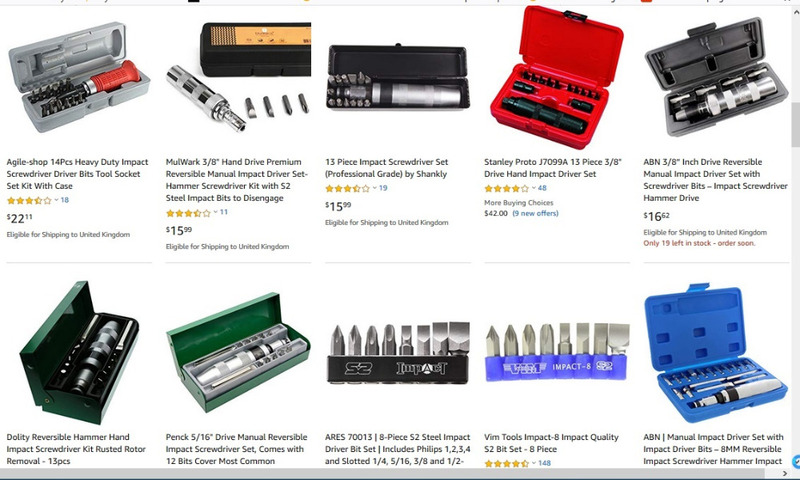 How about getting rid of all chrome tipped screwdrivers and getting the ones with black tips that don't just immediately ruin every screw head? "I'll never know it all but I'm willing to settle for knowing where to find the answer!" I don't have any trouble with rounding out screws since I stopped buying cheap screwdrivers. I've had my Snap On set a few years now, (chrome tipped) and while it was hard to justify the cost at the time, It has proven to be a good investment. Same goes for the wrench set. I stand corrected. Maybe I'll post my chrome tip screwdriver story in the off topic forum. ISTR black finish is Parkerising - Parkerizing it is a hard phosphate chemical coating. With crosshead, Phillips and Pozidrive screws using the correct size and style of driver is tricky. Even this list is not complete en.wikipedia.org/wiki/List_of_screw_drives . 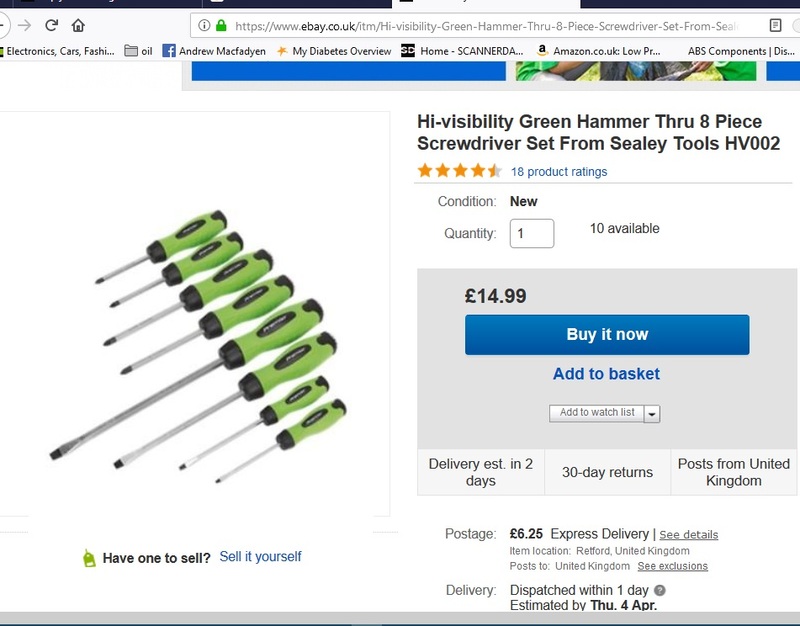 I generally look for "Hammer Through" screwdrivers as before trying to undo any screw on solid metal part I settle driver into the slot with suitable judged hammer blow. Another trick uncooperative screws is to use a tiny amount grinding paste on the tip of the screwdriver to give more grip , I believe there is a specialist product for this use called "Screw Grip" or "Screw Grab" or "Ez-Grip" but I have no experience of it. For brake drum and disc retainer screws an other solid screws on of these should be in every too drawer. Last edit: 02 Apr 2019 06:42 by Andy.MacFadyen. I had an aircraft from 1997 to 2017 and the mechanics were the ones who convinced me to use the black tipped phillips head screwdrivers. They actually made fun of me for using an old Craftsman (they were letting me remove inspection panels). For the screws I had already butchered, they had me put valve grinding compound on the screwdriver tip to get a grip, then discard the screws after removal. I think we only ended up drilling out one or two. It was pretty humbling to be taught about screw removal. I've used valve grinding compound on valves exactly once but too many times to count on screws. Last edit: 02 Apr 2019 06:50 by tmcquinn. "Hammer Through" aka "Strike-Thru" screwdrivers are the weapon of choice as you can settle the driver into the head of the screw with a couple of suitably judged taps. There are a couple of other options the quick and dirty one is use a little grinding paste on the tip to increase friction. there are also commercial products "Ez-Grip" , "Screwgrab" "Gettagrip" and others but I have never tried these.